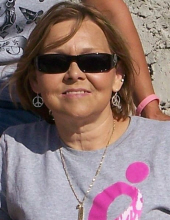 Sharon Loe, 53, of Vidor, TX died Tuesday, February 5th, 2019 at Vidor Health and Rehab. She was a lifetime resident of Vidor and enjoyed spending time with family, traveling, good food, listening to music and cooking. She worked as a paramedic for Zachary. Sharon was known to live life to the fullest. Visitation will be Thursday, February 7, 2019 from 4:00 p.m. to 6:30 p.m. at Turning Point Church with her funeral service at 6:30 p.m. She is survived by her husband; Wesley Davis of Vidor, 2 sons; Braddley McClelland and his wife Jennifer of Vidor and Jarrad McClelland and his wife Ashley also of Vidor. She is also survived by her parents; Horace Loe, Jr. and Mildred Loe of Vidor, 1 sister; Janet Smith and her husband Oliver of Vidor and 2 grandchildren; Jolie McClelland and Maverick McClelland, 2 nephews; Mason & Caleb Smith, niece Shay Fleichmann. To send flowers or a remembrance gift to the family of Sharon Kelley Loe, please visit our Tribute Store. "Email Address" would like to share the life celebration of Sharon Kelley Loe. Click on the "link" to go to share a favorite memory or leave a condolence message for the family.